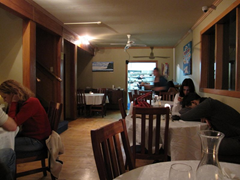 It was Valentine’s Day, so we headed out to the Blue Ice Cafe in Franz Josef. Their lower floor was packed and we had to come back at a slightly later time to get a table. They offered we could be served upstairs, so we checked it out. The upper floor is much more of a bar, with stools only and a pool table, so we chose to wait. 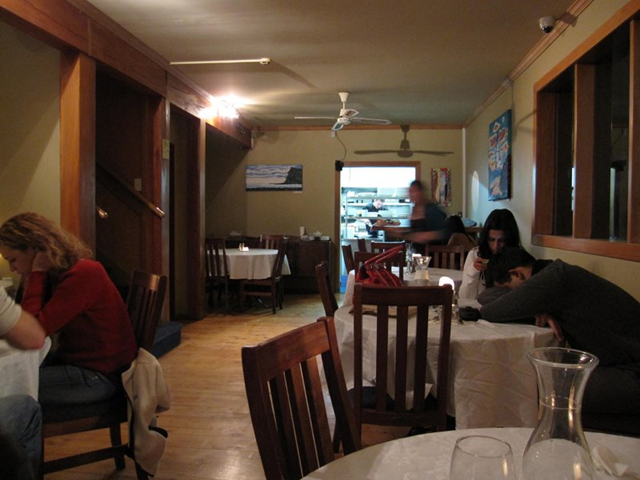 The lower floor has a nicer ambience and we were shown to a candlelit table. We were offered a highchair for our daughter, but it was really dirty and broken, to boot! 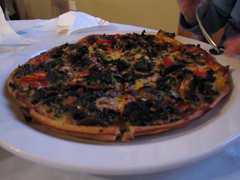 Wendy ordered a small pizza with spinach, onions, red peppers, mushroom and baby corn, $16NZD. It was more than big enough for one person and could probably be shared. The pizza was okay. Nothing special, but passable. It had lots of toppings, and the crust was very crispy and thin. Unfortunately it was also greasy, and took 25 minutes to arrive at our table. Ian’s rack of lamb, $34NZD got an A+ for presentation. It looked very appetizing and he was excited to dig in. Unfortunately the meal itself didn’t quite live up to the image. 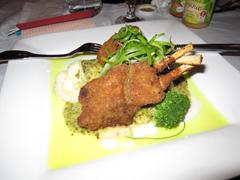 The lamb was breaded and very good but the breading itself had too strong a flavor. The vegetables were all sadly overcooked. The service was friendly, if slow, but overall the food just wasn’t good. We wouldn’t be in a hurry to return.